I was lucky enough to see A Chorus Line on Broadway in its first incarnation – twice, if memory serves. Its soundtrack became part of the perennial playlist in my mother’s house, and we used to dance around the living room singing "Dance: Ten; Looks: Three". Later, I got my own CD, and yet later, transferred all the songs to MP3. Needless to say, all of the songs are indelibly imprinted in my head. I didn’t see the 2006 revival because I had a small child and no time. But the small child is now 15, and a couple of weeks ago, she sang “What I Did For Love” at a recital. En passant that night, my sister-in-law told me that it was going to be at City Center last week, for a week, and one thing led to another and the child had a birthday and my other sister-in-law got tickets for my daughter (and me, as chaperone) to see it. It was spectacular. We were sitting up in the balcony, the house was packed, and there was a palpable joy in the room. What a delight to be there, and how lucky we were, me yet again, her for the first time. The building I work in is intimately connected to Michael Bennett, likely purchased and renovated by him with his proceeds from that original production. When I started working here, the building was home to several theatrical support shops: a costume shop, a shoemaker, a hat maker and a set designer. The hat maker, Woody Shelp, grew old, and retired, and his space was taken over by the costume shop. They sublet it to a costume designer. Eventually, the costume shop went out of business, but the designer stayed, until last year, when he decided he could save money by working out of his home. He left behind a few pieces of furniture, some of which dated back to the hat maker days, the hat maker who died in 2004. Before we re-leased the space, we pondered what to do with the small waist high work table. 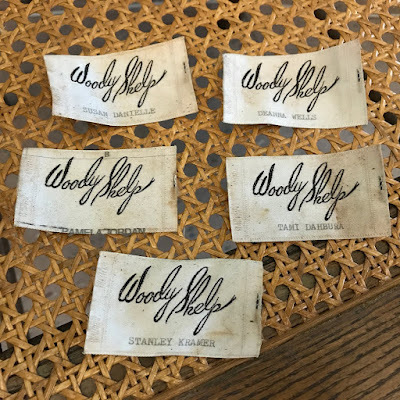 I opened the ill-fitting metal drawers and found magic: five of the hat maker’s labels stamped with the names of actors for whom hats were destined, a handful of hatpins, and a little piece of the beaded organza band Woody used for all of the Chorus Line hats. I have it squirreled away in an envelope, pinned to the bulletin board in my office. I love that I knew the hat maker. I love that I got to watch A Chorus Line next to my jaw-agape, singing-in-my-ear girl. I love that I have a tiny piece of one of those glittering gold top hats. "shows," not shoes. I was typing around a big white cat. Fabulous. What a Broadway masterpiece. What beautiful artifacts to have found. I love that you have such a personal connection with the original production.